A common method used by traders to identify Support and Resistance levels is by using psychological numbers that are commonly referred to as “Round Numbers”. Most people (including traders) have an easier time comprehending and understanding Round Numbers. Assume that another trader asks you where the S&P 500 is going to top out this year. Typically your response would be 1825.00 as opposed to 1823.80, because it is much easier to comprehend the Round Number of 25.00. This is a classic example of why trading psychological Numbers can provide excellent support and resistance levels. 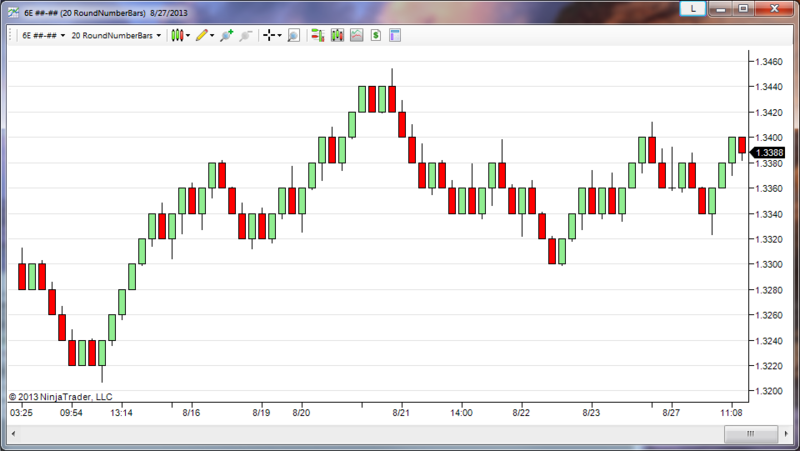 Looking at the image above, you will see an image of the “Round Numbers Bars” Indicator for NinjaTrader (technically it is a bar type). These bars allow the user to select an interval at which to define the Round Numbers. In the image above, I am using 20 ticks as the setting for my Round Numbers. Since the chart is displaying the Euro Currency Futures, a setting of 20 ticks means that the round numbers occur at every price that is evenly divisible by 0.0020 (20 ticks in the Euro Currency Futures market). These Round Number bars are similar to Range bars and Renko bars, but they will always open and close at a psychological number (support and resistance level). This makes it easy for you as a trader to identify these key support and resistance areas, making trading psychological numbers a more feasible task. 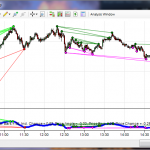 Download our Free Indicator for NinjaTrader today using the link below. I downloaded and imported your free round numbers indicator. It says that it was imported but when I go to install it on my chart is doesn’t show up in the indicator list for NinjaTrader. Got any advice? The Round Number Bars are not technically an Indicator, they are a Bar Type (like Renko, Tick, Volume, etc.). So you will see the option to use the Round Number Bars when you are setting up your chart, not in your indicator list. You can right click your chart and select “Data Series” to change an existing chart to use the Round Number Bars. Hi, I am trying to load the round numbers bars into ninja. I am famailiar with changing bar types as I have used renko and tick charts before so I know how to change the bar type yet it still doesn’t appear in the list when I go to data series bar types. I t says its been downloaded but its not there, could it be this was for an older version of ninjatrader? It is most likely due to a conflict with one of the other bar types on your computer. The Round Number bars are using the type ‘Custom6’, which is probably also being used by another one of your custom bar types. You will have to remove the conflicting bar type, or modify the round number bars to use a unique type. Yep, that was it! Thank you for your help!